It can be hard to stand out as a platformer in a genre so well-trodden by memorable titles. 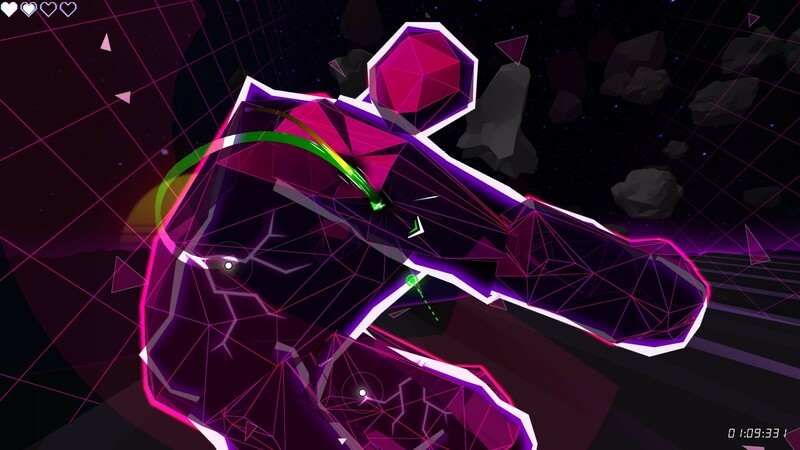 On Rifter’s Steam page, developer IMakeGames pays homage to the many influential games that came before it: Dust Force, Sonic, Bionic Commando, Hotline Miami… and I’d throw SpeedRunners in there for good measure, as it seems its most direct relative. But Rifter’s distinct style builds an atmosphere wholly its own. A neon pulse permeates each stage, breathing energy into otherwise sparse planets populated by geometric shapes, a minimalistic design that only distracts when it wants to. Dashing and swinging through each level as the eponymous Rifter never fails to unleash a barrage of multi-colored sparks and shrapnel in your wake. Even the destruction you leave explodes in a symphony of color. And you do a lot of destroying. 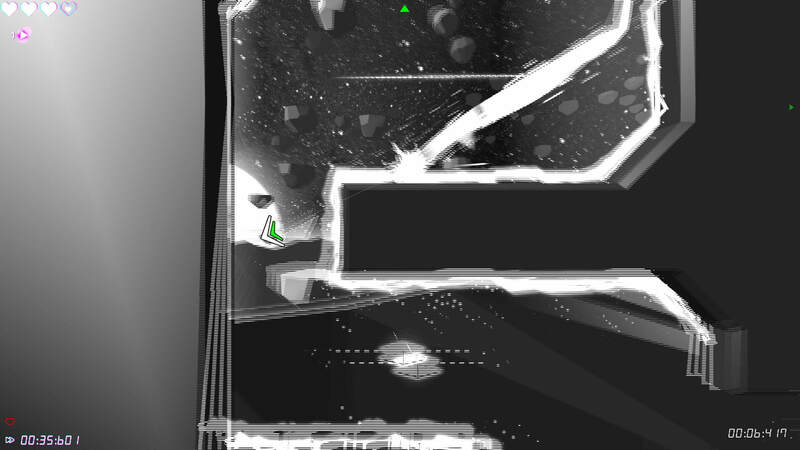 Speed through a level successfully and you get a chance to smash into the planet’s crust, creating a rift. Pop open enough of those and you’re on to trashing a tower. And after you’ve toppled enough towers, it’s time to decimate the planet with an explosion rattling from its core. And why? Because your sidekick drone, Tiny, tells you that it’s what Rifters ought to do. It’s a thin enough premise at first, but the characters hit their humor beats so well that it’s easy to accept things and keep on moving (very, very fast). Especially with Rifter’s ‘80s synthwave soundtrack, the equivalent of aural cotton candy, punctuating every movement to a beat. Later, encounters with other Rifters who failed their quests hint at a metaphysical struggle among those of their trade, with their comments threatening to break the fourth wall in how they challenge your true motivation, “your” being the Rifter or player depending on how you look at it. 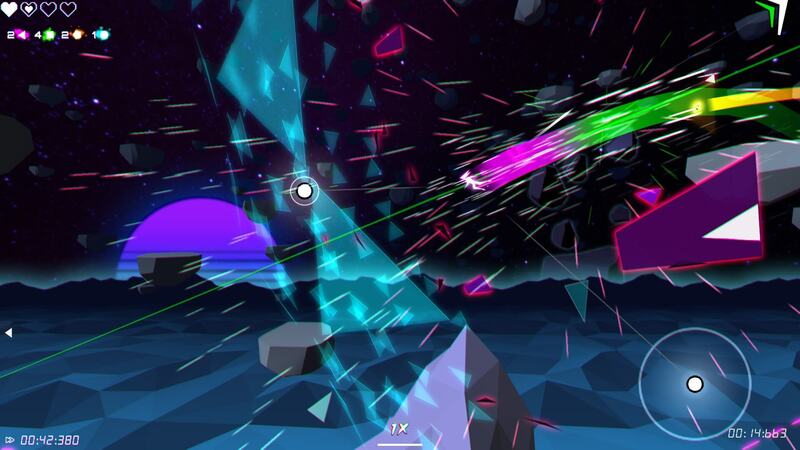 All of this is translated through Rifter’s rare moments of stillness, as its gameplay demands all focus be on getting from point A to point B as neck-breakingly fast as possible. And, yet, it’s in this singular vision where things begin to unravel. As its Steam page boasts, “Rifter puts players on the bleeding edge of speed and control” – and often teeters off. Its core components spell potential, and, in the game’s beginning at least, their infinite combinations build a sense of flow when you finally learn to implement each mechanic successfully. Latching onto luminescent nodes with your grappling hook (via a click of the mouse or flick of an analog stick, depending on your preference) slings you with centrifugal force, which grants you a speed boost as well as access to new areas. Later, dash points ramp things up further, sending you flying forward with a single click. Shortly into your quest, you also uncover a dash ability to break through barriers and give your jump that last little “umph” if you mistimed your release from a node. While you can technically get through the game without piling on these mechanics, buying upgrades makes latter stages infinitely more bearable. Using the shards strewn throughout each level, available purchases range from wall climbing to shortening your hook mid-swing to skidding on water if you build up enough speed. And you’ll need all the help you can get, because Rifter’s learning curve is stiff. If getting used to being a living pendulum wasn’t hard enough, many levels also feel just a few QA tests shy of flowing flawlessly. As the environment acquires new obstacles – electrified barriers, adversaries, gigantic moving walls of death, etc. – the margin of error allowed for each level falls sharply, making anything ill-placed that much more aggravatingly noticeable. Like a node just close enough to a barrier to turn any swing faster than a snail’s pace into a death spirals. Or an enemy placed outside the apex of a dash point, barely far enough for you to register its existence before you crash into it. Or an animation for taking damage that’s simply too long to allow for any correction if you trip up surrounded by multiple hazards. 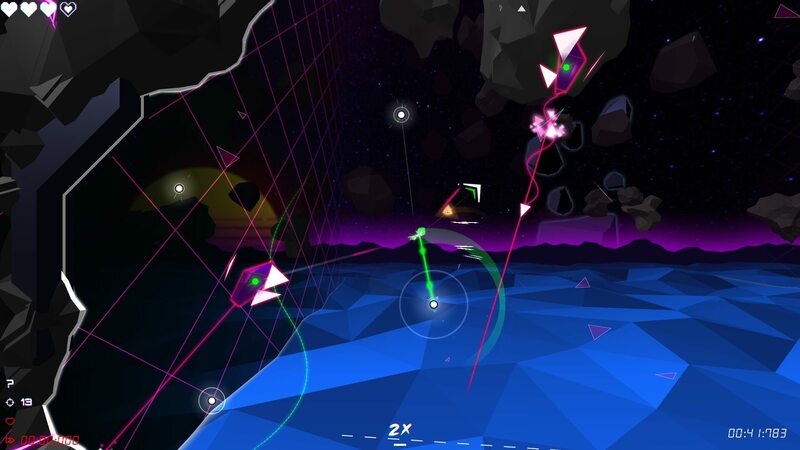 In Rifter’s early stages, I’d start to pull back if I felt myself getting frustrated, instead letting my frantic movements give way to momentum’s hand. It was faster than my reflexes anyway. As the levels grow more complex, though, Rifter’s demand for pinpoint precision begins to directly compete with the need for speed it so desperately cultivates. Too many times I found myself swearing I’d aimed my cursor right at a node but my grappling hook failed to deploy, as if I’d missed it – an annoying hiccup in the few cases where it wasn’t deadly. Alternating between held mouse clicks and quick taps – depending on if I was trying to reach a platform or node – also proved frustrating in levels I’d never seen before. Unless I’d done a previous playthrough, by the time I’d both acknowledged what type of ledge was approaching and what I needed to input, I was already soaring past my goal. Taking too much damage also reset you at the beginning of the level, rendering several levels tedious in their repetition. This unyielding demand for accuracy despite Rifter’s breakneck pacing may add to the fun for some players, adding challenge to an already difficult undertaking. But in these kind of masocore games, I feel like each of your many, many deaths should bring with them another inkling of understanding about where you went wrong. With Rifter, I was too frequently left with no idea where I went wrong. Ultimately, the game demands too much of the player at once, struggling to balance speed, precision, and technique in a way few games have mastered. And this coming from a masocore fan. Rifter is available now on PC, Mac & Linux. Alyse Stanley is a freelance writer and editor who's always down for a great narrative, whether that's a walking simulator, dating sim, or playing Fallout: New Vegas for the umpteenth time. She started calling her dog her "son" ironically at first, but it has since become unironic.